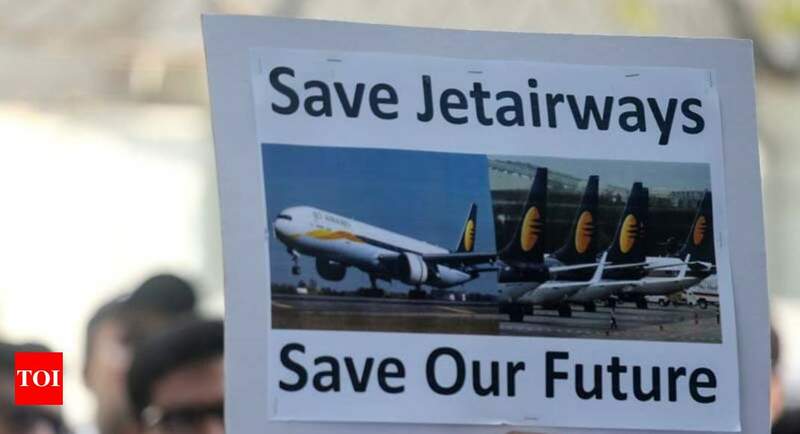 MUMBAI: Jet Airways pilots body, the National Aviator&apos;s Guild, on Monday appealed the State Bank of India (SBI) to release Rs 1,500 crore, which was proposed to be infused in the ailing carrier as part of a debt-restructuring plan last month. The airline is operating just 6-7 planes, with almost its entire fleet being grounded due to non-payment of rentals to lessors amid severe paucity of cash. Spicejet is now hiring engineers and pilots at much lower pay than their current salaries at the financialy-troubled Jet. Industry sources said that pilots from Jet Airways are being asked to take salary cuts of 25-30% while engineers have been advised to settle at 50% of their current pay package. "We would like to appeal SBI to release Rs 1,500 crore funds for the airline to help it continue operations. We also appeal Prime Minister Narendra Modi to save 20,000 odd jobs at the airline," National Aviator&apos;s Guild (NAG) vice-president Adim Valiani told reporters at the airline&apos;s headquarter, Siroya Centre, here on Monday. Earlier, the airline&apos;s pilots, engineers and cabin crew members assembled at the headquarters to show their solidarity. The airline&apos;s pilots along with engineers and senior staff were last paid for December, 2018. This apart, the airline has also defaulted on the March salary of other categories of employees as well. Last month, an SBI-led consortium of lenders had taken management control of the airline post a debt-recast deal, following which the lenders had proposed to infuse as much as Rs 1,500 crore to the carrier to keep it afloat till the time it gets a investor. The Monday meeting with lenders is reportedly expected to take a final decision on the quantum of funds to be infused immediately to avert a possible shut down. A meeting between the airline management and its major lender SBI last Friday could not take a decision on the fund infusion issue. All copyrights and content belong to their respective owners. Images and text owned by other copyright holders are used here under the guidelines of the Fair Use.